So says Bruce Lee in archival footage shown in John Little’s documentary film Bruce Lee: A Warrior’s Journey. 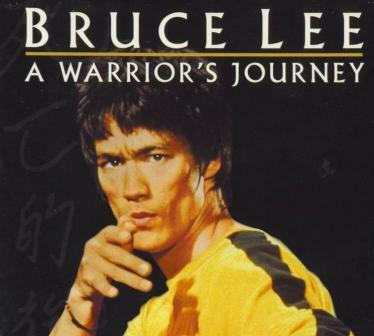 And if anything, A Warrior’s Journey is an honest, heartfelt expression of love for the legendary martial artist. Aside from the narrator’s awkward pronunciation of “gung fu” and the less than inspired dubbing performances by Kareem Abdul-Jabbar and Ji Han Jae for the reassembled Game of Death footage, the dedication put forth by the filmmakers really shines through. Skip the fictionalized bio Dragon: The Bruce Lee Story, and instead take a look at this John Little documentary. While you’re at it, don’t bother watching Game of Death anymore either. This film contains 41 minutes of lost footage showing the master in action, edited together based on Bruce Lee’s own notes. You can read my full review of the film here. Since Bruce Lee: The Legend is included as the bonus fifth disc in 20th Century Fox’s now out-of-print “Master Collection” boxset, the film must be worth at least a look, right? 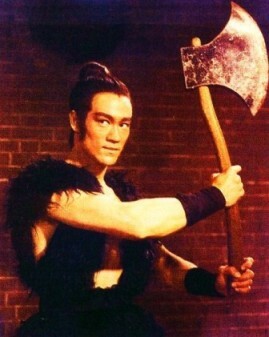 Generally speaking, the movie does a good job of tracing Bruce Lee’s life, mainly in the form of career highlights that showcase his early stints on American television shows (in The Green Hornet and Longstreet) on up to his eventual ascension to cross-cultural superstardom through his Hong Kong movies in the early 1970s. Overall, I found this American version* of the Golden Harvest-produced bio Bruce Lee: The Legend to be a decent, occasionally daring biography of the man nicknamed “Little Dragon.” You can read my LoveHKFilm.com review of this documentary here. Under the cut, check out the opening minutes of the film, which includes footage of Zu: Warriors from the Magic Mountain with Brigitte Lin! Leaping from the pages of the comic strip by Yuen Wo-Pan comes The Kid, a 1950 Hong Kong film featuring a ten-year-old Bruce Lee in a starring role. Although The Big Boss was Lee’s first breakout motion picture as an adult, in truth, the now legendary icon starred in about twenty Hong Kong-made films as a youth before eventually relocating to the United States at the age of eighteen. 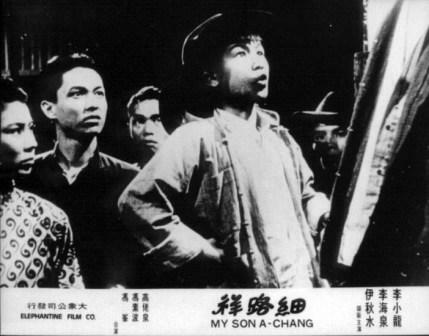 In this, his fifth movie (aka Kid Cheung, Little Cheung, and My Son A-Chang), Lee plays Ah Cheung, the title character. For my full review of the film, click here. To see a short clip of the spunky little guy in action, check out a scene from the film embedded just under the cut. Before CGI face replacement technology, there was the revolutionary “let’s paste a cut-out of the deceased actor’s head on a mirror” technique. 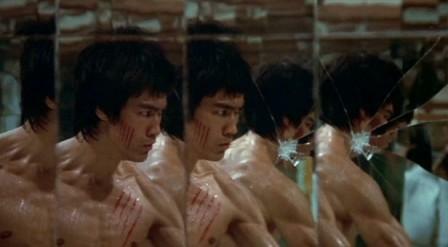 After Way of the Dragon, Bruce Lee began filming the ending battle sequence for a film he planned to call Game of Death. But Hollywood came calling so Lee shut down production on the film to begin Robert Clouse’s Enter the Dragon instead. After completing the American film, Lee had hoped to finish the postponed Game of Death, but sadly it was not to be — two weeks before Enter the Dragon’s premiere, the “Little Dragon” abruptly died of a cerebral edema. Enter Raymond Chow, the famous Golden Harvest producer who owned the rights to the rare footage. Wanting to make a tribute to Lee (and make a little money in the process), Chow persuaded a reluctant Robert Clouse to reshoot the film with doubles and create an entirely different script from Lee’s original idea. As good as the filmmakers’ intentions may have been, in hindsight Game of Death comes off less like a fitting tribute to the master and more like a crass, shockingly amateurish disaster. Though Game of Death features Bruce Lee in his final onscreen appearance and even sports a rousing final act, the majority of the film can only really be deemed entertaining in a cheesy Mystery Science Theater 3000/Ed Wood kind of way. Bruce ponders a Lacanian reading of this famous scene from Enter the Dragon. Robert Clouse’s 1973 worldwide hit Enter the Dragon is a landmark film for a number of reasons. For starters, not only did the movie help introduce American audiences to the wonders of the martial arts film genre, but it also propelled Bruce Lee to international superstardom, albeit posthumously. The film has been showing up on HD cable a lot lately, and I’ve been meaning to re-watch the whole thing from the beginning. But from the bits and pieces I’ve watched in glorious high definition, the movie still seems to hold up as the most polished and genuinely fun movie in Bruce Lee’s all-too-short filmography. If I ever do get a chance to sit down and watch this martial arts classic, I’ll be sure to revise my scandalously short, but trivia-packed LoveHKFilm.com review, which you can read here. Oh, and under the cut, there’s a nifty, totally 70s trailer embedded for your perusal. Conventional wisdom would suggest that when comparing martial artists, Bruce Lee stands supreme as the intense, indestructible killing machine, whereas Jackie Chan is the reverse: a happy-go-lucky everyman who just happens to know kung fu. 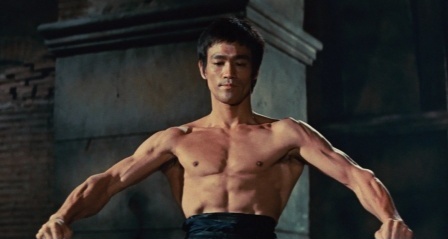 But Bruce Lee’s performance in 1972’s Way of the Dragon runs counter to that assumption. Oh sure, Bruce kicks the living bejeezus out of everyone who gets in his way, but to be honest, his character is only a step away from the prototypical Jackie Chan character. Just like Jackie was in Rumble in the Bronx, Rush Hour, and Shanghai Noon, our man Bruce is the proverbial fish out of water in Way of the Dragon. I took in a viewing of the Cantonese language version last night, and although I’m less enamored with the somewhat amateurish “comedy” bits that open the film, I’m still quite fond of the film. Bruce Lee remains a magnetic presence, and his confrontation with Chuck Norris at the Colosseum is definitely worth a look. For my full thoughts on the film, check out my review here. As with the previous Bruce Lee retro reviews, you can enjoy a vintage trailer embedded under the break. Though The Big Boss was a huge success for Bruce Lee in 1971, it was the 1972 follow-up Fist of Fury that truly catapulted him to the level of superstar - and with good reason. Once known in the United States as The Chinese Connection, this Lo Wei-directed flick may seem like just another “You killed my master!” revenge yarn, but Bruce Lee’s charismatic performance puts Fist of Fury at the very top of the heap. Spawning unofficial sequels, remakes, and numerous tributes, Fist of Fury rivals Enter the Dragon as Bruce Lee’s most known and most beloved film, particularly among Chinese audiences.